Top Row (L to R): Reliance, # E-9546, Landers, Frary & Clark, New Britian, Conn, all black, works, $50; Hold Heat, some rust, cord should be replaced, works, $25; Toast Queen, Lexington Machinery & Developing Co, Clifton, NJ, minor rust, works, $25. Bottom Row (L to R): Unmarked, Sides & top are balck, paint missing, works, $20; Merit Mode, Model z, Merit Mode Inc, Buffalo, NY, missing knob on top, works, $70; Unmarked, All aluminum, cute toaster, works, $25; Toastmaster, Model 1A5, Automatic Pop-up, piece missing on base, single slice pop up, SOLD. 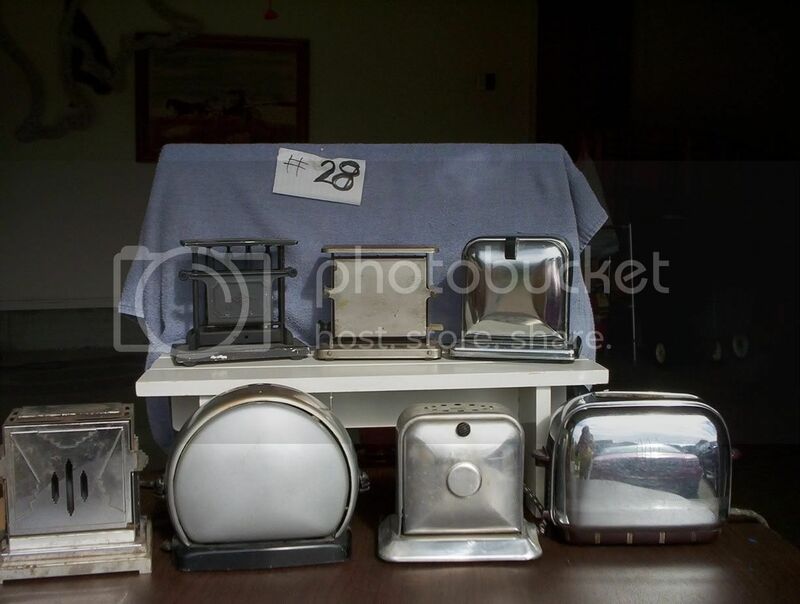 Bottom Row, Toaster Number 3 is a Penn-Air Toaster Model #277,,,I have one that has never been used and has the original tag. Can you tell me how much it is worth. My email address is sandragold2g4e@aol.com. Thank you so much. Toasters, mirrors, brushes and other antique items. We welcome questions. Either leave them in the comments or drop us an email. For PayPal Mastercard and Visa purchases, simply click on the button below and enter the total purchase amount, adding $15 shipping (USPS flat-rate) per toaster. At the PayPal site you can enter the shipping address and toaster description (e.g. Group 1, Top Row: K&M, Cat. #517-0) where indicated. Please send us an email right away advising of any new PayPal purchases so we can be made aware and begin packaging the toaster for shipping. 1440 SW Twin Gates Dr. Shipping: $15 anywhere in the U.S. Rates may vary to locations in Canada and Mexico. Satisfaction guaranteed on all purchases. If you would like us to send you more information about an item or perhaps a closer photo of one, just ask us! Will ship to the United States, Canada and Mexico.